With my days in the office winding down before making my pilgrimage to the mecca that is the Midwest, I had to do some last minute shopping for bosses and co-workers. What was slated to be a quick trip turned out lengthier than reasonably expected, and I ended up missing the first 10 or so minutes of Marquette’s game with Arizona State. Upon opening Twitter, I was bombarded by a barrage of tweets praising Luke Fischer. It’s one thing to read people’s infatuation with a player who has logged 6 minutes in his career, and it’s a completely separate one to witness it yourself. It wasn’t so much the buckets, which were classic, or the blocks, which were impactful, or the rebounds, which were definitive. The stats speak for themselves and will draw praise from all corners of the country, as they are downright gaudy. Fischer scored 19 points on 9-of-11 shooting, grabbing 9 rebounds and blocking five shots. You might recognize the last player to make such an impact in his debut after sitting out a season. Take a look for yourself at the box-score metrics in video form that Marquette Athletics wisely packaged on their YouTube page. No, what really did it for me was the fluidity and agility he already possesses. Chris Otule was a tree in the post and impacted the defense more than he was ever given credit for, but he lumbered to close out shooters or stick with driving guards. Davante Gardner was a cat around the rim, putting up–and in — shots no big man had the right to attempt. But even outside of his significant defensive deficiencies, he never was able to clear lanes as well as a less-mobile Otule did. In the small sample size that is 33 minutes against a mediocre team, Fischer parlayed parts of what made Otule and Gardner so valuable into one heck of a Christmas gift for Wojo and company. He’s not as strong as Chris ever was and will never have the creativity or shot-making ability Gardner displayed, but in combining some of both, Fischer will be a nightmare for opposing coaches to plan against. And here is the first caveat of the script, there was limited tape available to Herb Sendek and the Sun Devils on Marquette’s Luke Fischer (with only a smidgen of hobbled Luke at Indiana), so there wasn’t really a set game-plan against him. As the fish is out of the pond, Luke won’t be catching any other coaches by surprise. That makes a big difference. Just look at the way ASU’s offense attacked (or didn’t) in the second half once adjustments were made. The Sun Devil guards didn’t penetrate quite as deeply and the bigs rarely put up a shot with Fischer on them. You can see the difference in the game plan by the results by half: 5 blocks in the first, 0 in the second. So no, these highlight reel numbers aren’t truly a barometer going forward. Coaches will know not to mess with Luke Skyblocker and will gameplan accordingly. But diminished stats by no means will decrease his value. He is already, and will continue to be the rest of his Marquette career, the lynchpin of the defense. Did you notice how Marquette was able to mix up man -to-man and zone defenses on the fly? Having a shot blocking presence behind the guards allows for a bit more aggressive play on the perimeter and masks some of the blow-by’s that created a lay-up line against teams like Nebraska-Omaha. Fischer won’t prevent all perpetrators from scoring, duh, but will provide a more challenging obstacle to shoot over/around than Steve, Juan or Deonte ever could. Offensively, Fischer’s spacing was a thing of beauty. Did you see how much room to drive quick guards like Duane and Jajuan had? Remember how those drives ended in rejection after rejection just a week ago? No, it’s not all Fischer’s fault that those two blew up, but he has a high IQ for floor placement and uses his body well to shield defenders to create driving lanes. He put himself in good positions to score and, unlike Davante, knew when (and how) to pass out. He finished with a lone assist, but he created a few open shots that didn’t go in. All this is augmented with a limberness that a 6-11 center usually doesn’t possess. He’s not Henry Ellenson, beating people off the dribble, but the pick and roll game should provide some high quality shots even when the set plays break down for Duane and Matt. 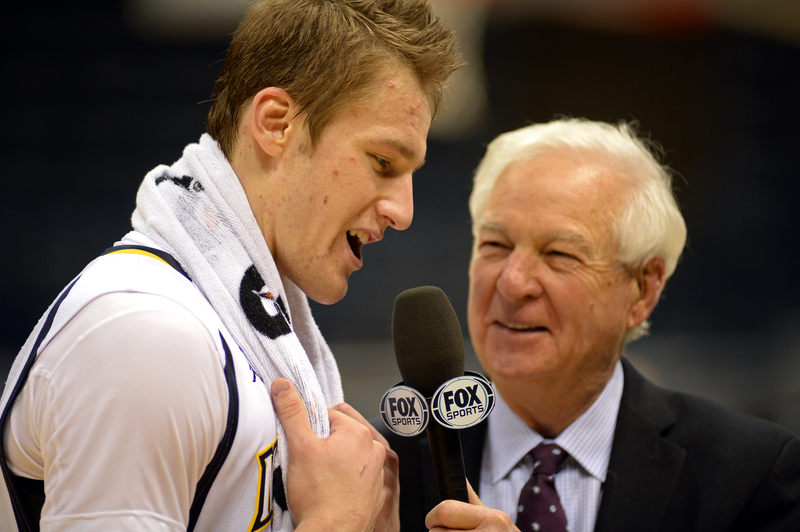 It wasn’t just Marquette followers salivating over Fischer’s coming out party. The national media took notice as well. Luke Fischer will completely change Marquette: The transfer from Indiana made an immediate impact in his season debut Tuesday night vs. Arizona State. If his initial production is any indication, the 6-11 big man instantly will be one of the Big East’s better post players. He collected 19 points, nine rebounds and five blocks in a 78-71 win, while providing Steve Wojciecjchowski’s team something it was missing — a legitimate anchor in the pivot. Before Tuesday, the Golden Eagles didn’t have a player taller than 6-7. The Wisconsin native will be an all-conference player before he’s done — he’s that good. Luke Fischer has 14 and 9 in his Marquette debut — midway thru second half. Think Tom Crean and IU could have used a skilled big this year? Luke Fischer had a huge debut for Marquette in tonight's win over Ariz State: 19 pts, 9 Rebs, 5 blocks. Now that's filling a need. Meanwhile, Luke Fischer is having quite the impact in his Marquette debut. If Marquette takes care of business against the three cupcakes left, it will have put itself in the picture to be a bubble team, as I vented about on Twitter yesterday. That is not to say Marquette will be dancing come March, but Fischer has altered the ceiling. Before anyone come running over accusing me of overreaction to one game, I do realize players have good and bad games and judging with a limited sample size is inherently flawed. But as I’ve tried to demonstrate, what Fischer provides isn’t just stat-friendly metrics. He is a weapon best utilized with other weapons. Jajuan’s pick-6 abilities become a bit more noticeable, Duane’s driving tendency more profitable, Carlino’s shooting less voluminous and Juan’s glue that much stickier. I greatly underestimated his potential impact, but Luke Fischer has reeled me in. Hook, line and sinker. Great read! Thanks. Love the “pick-6” reference.